A Perfect little something for someone that you'd like to acknowledge their importance in your life. 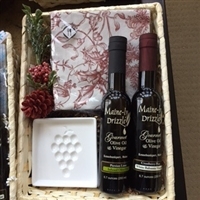 Great basket for colleagues, neighbors, teachers, friends and family; all around a fun way to package your favorite oil and vinegar products. 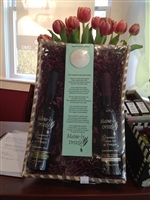 This basket comes with two 2 oz Maine-ly Drizzle Products of your choice and a Jill Butler designed Tibit Dish. 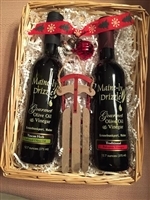 Unless otherwise requested we will include Tuscan Herb Organic Extra Virgin Olive Oil and 18 year Aged traditional Balsamic Vinegar (our number one sellers). If you'd like to change these choices please specify in the comments section during check out. Have you ever wondered what the Legend of the sand dollar is....well this package contains a sand dollar from Gooserocks Beach in Kennebunkport, ME along with the legend of the Sand Dollar. The author is unknown but the legend lives on!! 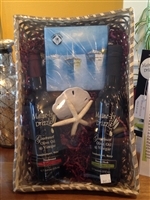 Also contained within this wicker basket are 6.7 oz bottles of our stores top sellers, this summer: Persian Lime Infused Olive Oil and Cranberry Pear White Balsamic Vinegar combined is perfect for cucumber slices, tomatoes, salads. Used separately for your favorite fish and other dishes found on our website!! 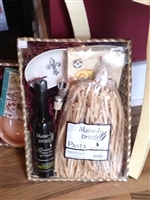 Beautifully packaged wicker basket includes two 12.7 oz products with seasonal appropriate ornaments. Unless otherwise specified in the comments section during check out we will include one of our customers favorite oil and vinegar, Cranberry Pear white balsamic vinegar and Persian Lime olive oil. You can't go wrong with these two top sellers for the true foodie experience. 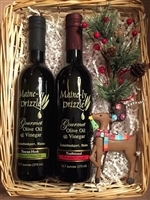 Versatile products in this gift package include Maine-ly Drizzle's 12.7 oz 18 year Aged Traditional Balsamic Vinegar and Tuscan Herb Infused Olive Oil. Also included are a reminder that summer is right around the corner with a starfish and sand dollar and summer cocktail napkins. Simply beautiful. Mom will thank you each and every time she uses these products while baking, serving, dipping or any of the other many methods she wants to use these versatile, top sellers. 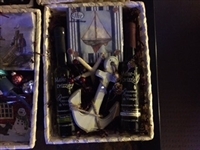 For the sea lover, this basket includes 6.7 oz Tuscan Herb Olive Oil and 18 year Aged Traditional Balsamic Vinegar and really nice set of cocktail paper napkins and a oversized anchor ornament.